Live…in Malibu, CA at 33261 Decker Edison School Rd. Malibu, CA. Never before on the market, this beautifully designed custom built home is approx 6,300 sq. and sits on 5 usable acres with tremendous privacy and magnificent canyon mountain and ocean views. Tastefully designed Spanish style home with handcrafted tiles, custom cabinetry, mature landscaping, large pool area, side yard, orchard with plenty more area for additional trees, gardens and horses. Detached 3 car garage with high volume for large vehicles, additional structures for horses as well as several large pads for other out buildings. Just a few minutes from PCH yet feels like you are truly away from it all. 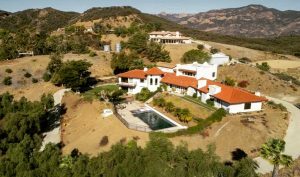 Contact 4 Malibu Real Estate listing agent Brant Didden for more information on this property.